Coming soon a web store for all your dutch needs "ourdutchstore.com"
...the Dutch pottery famous around the world; takes almost a full week to produce. 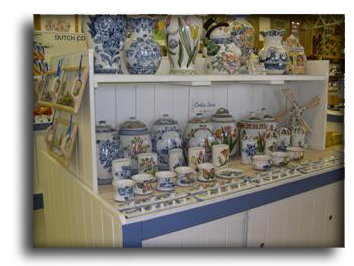 We are the only production facility in North America, offering over 400 different hand painted Dutch pottery items. Follow the process of making these fine pottery items; from pouring the liquid clay into molds, to firing the clay at 2,000 degrees. 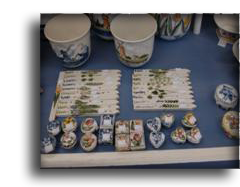 Then talk to the artists as they hand paint Dutch designs and glaze each item for the perfect shine. Wooden shoes are a very practical footwear for gardening, getting the mail, and general use. See the shoe maker produce wooden shoes from block of poplar wood using authentic Dutch machinery (still used in Europe today) designed especially for making wooden shoes. We produce an excellent grade of wooden shoes in sizes from very small doll to a size 14 adult shoe. These great shoes can be customized with almost anything you can imagine. We have not forgotten the past completely, our wooden shoe hand carver was specially trained and received his diploma in wood carving from the Netherlands. De Klomp Wooden Shoe and Delft Factory is a store that words cannot describe. From the time you walk into the door, your eyes will not believe the beauty and splendor of the items on our shelves. Talk with our wonder staff as they explain how we make our product from beginning to end production. See the detail and pride of work that goes into each piece of product we make. We offer you over 400 different pieces hand painted by our highly trained staff.